Simplicity, versatility, coupling and ease of movement of the machine from one part of the factory to another, are all factors that make ROSCAMAT models essential in mechanical manufacturing. They are especially useful for mould-makers, die-makers, manufacturers of machine components, tooling, metal dressers and manufacturers of capital goods in general, and as auxiliary machines for second operations in machining centres. The machine is comprised of a radial arm that is joined to an oscillating arm that uses a pneumatic spring. The head and electric motor are located at the end of the oscillating arm, permitting movement with the correct threading angle within the work area. The motor rotation speed is adjusted with a control located on the radial arm, so the speed can be adapted to each thread size. The tap-holders with clutch go directly to the motor. Optionally, the machine can incorporate an adjustable head for threading in horizontal direction, as well as automatic lubrication of the tap. The machine is comprised of a radial arm joined to a balanced oscillating arm by means of a selective load damper. It can be secured to any work bench or table, either with bolts or a fast-fastening flange. Equipped with a single-phase electric motor (220V or 110V), the rotation speed and torque are regulated by a series of 7 different fast set-up and easy-to-couple regulator modules to machine. The speed can thus be adapted to the size of the thread. Optionally, the machine can be equipped with an adjustable head –VH- to thread in horizontal direction. It also has automatic tap lubrication and threading depth control. Large-scale machine but easy and flexible to handle. It is the most powerful machine of the ROSCAMAT range. With an optimal work area and equipped with a single-phase electric motor (220V), its threading capacity goes from M3 to M36. The rotation speed and torque are adjusted by means of 6 fast set-up regulator modules, coupled to the motor. It is equipped with automatic motor lubrication and depth control that are easily regulated by controls located on the arm. The same machine can also be used with adjustable head –VH- for threading in horizontal direction. The machine has a small compensated cylinder on the base that enables us to raise the working height by 160 mm. TECNOSPIRO MACHINE TOOL S.L. is a company with a long mechanical tradition and more than 60 years’ experience in mechanical systems, and 30 years manufacturing articulated arm threading machines. 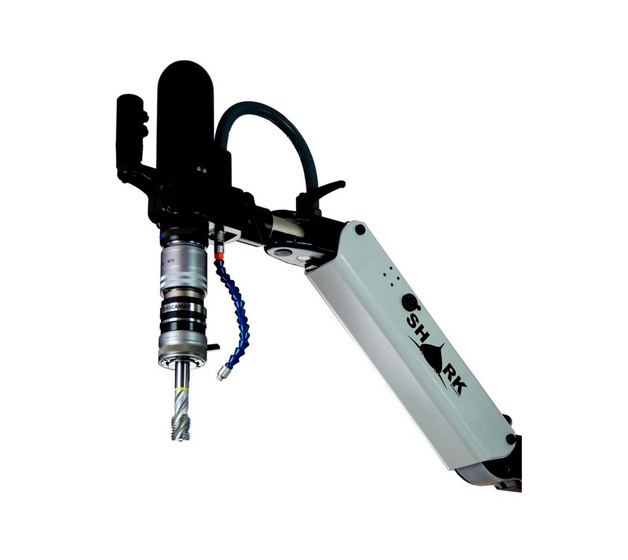 Its product range also includes the make, 3ARM, ERGONOMIC and light-weight assistance arms, designed to handle or hold any medium-weight tool, eliminating joint problems for the operators.